Gordon Brown looks increasingly likely to face a Labour leadership challenge after it emerged there will only be one left-wing candidate. 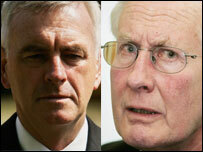 Labour MPs Michael Meacher and John McDonnell - who had been planning separate leadership bids - have agreed one of them will withdraw. They are expected to meet on the day Tony Blair resigns and compare how much backing they have among Labour MPs. The one with fewer nominations will step aside and back the other. This will boost the prospect that one of them will be able to gain the 45 nominations needed to be entered in the ballot. Mr Blair is widely tipped to step down within days of elections in Scotland, Wales and English local authorities, to be held on 3 May. Downing Street has denied press reports Mr Blair will stand down before polling day. Chancellor Gordon Brown is the runaway favourite to take over as leader and his campaign says he already has the support of 217 Labour MPs - more than half of the Parliamentary party. But the chances of him facing a contest rose after warring left-wing rivals Mr McDonnell and Mr Meacher agreed to bury the hatchet in a meeting on Thursday evening. "We are delighted that after weeks of our campaign trying to secure this deal Meacher has finally agreed. We only hope he sticks to it," a spokesman for the McDonnell campaign told the BBC News website. "The Labour movement now has the prospect of a real contest for the leadership of our party. John McDonnell will have the nominations required to challenge Gordon Brown." Mr Meacher told GMTV, in an interview to be broadcast on Sunday, that he had 24 "signed nominations", including former ministers, although his campaign team have refused to release any names. Mr Meacher said he was confident the majority of Mr McDonnell's supporters would switch their allegiance to him if Mr McDonnell dropped out. But he were to drop out, his supporters would not reciprocate, said the former minister. "So I think he would be struggling to get there but I am convinced that I can," he added. There has been little love lost between the rival left-wing contenders, with Mr McDonnell recently branding Mr Meacher "deluded" in his blog. This followed claims by Mr Meacher, in a letter to the Guardian, that Mr Brown was frightened of a challenge from the former environment secretary. He claimed a story in the Guardian newspaper - that he had just three supporters - had originated from the Brown camp. A Meacher spokesman also claimed Mr McDonnell had just 15 nominations - something vigorously denied by the McDonnell camp, which insists it has enough support to get on to the ballot. Mr McDonnell, champion of the left wing Campaign Group of MPs, has been drumming up support for a leadership bid since last summer. Mr Meacher entered the race in February. The prospect of a Cabinet-level challenge to Mr Brown has all but disappeared after Environment Secretary David Miliband insisted he was "not a candidate," although Home Secretary John Reid has not ruled out a bid. There is also speculation a challenge from the left might flush out a Blairite contender, such as former home secretary Charles Clarke, raising the prospect of a three-way contest for the leadership.